This stunning coin pays homage to the special relationship shared by Houston, Texas and Perth, Australia. The energy-themed coin originated with the founding of the Houston-Perth Sister City Association (HSPCA) in 1984, which was based on historical naval ties in WWII and the strong synergies between the two cities’ energy sectors. Today, Houston and Perth are two of the largest energy hubs in the world, and recently celebrated 30 years of partnership. The ties between Houston and Perth can initially be traced to the World War II battle of Sunda Strait, where both the USS Houston and HMAS Perth attacked a superior force of Japanese ships in an attempt to stall their advance towards Australia. Both ships were lost along with many men, but their sacrifice allowed the American and Australian navies to halt the Japanese advance and helped forge the relationship now shared by Houston and Perth. The bond between the two cities was further strengthened during John Glenn’s 1962 spaceflight, when the citizens of Perth turned on all their lights, allowing the astronaut to view the city from orbit. In the 1980s, when Houston sought to expand its global ties, Perth was an ideal partner for cultural, historical, and economic reasons. 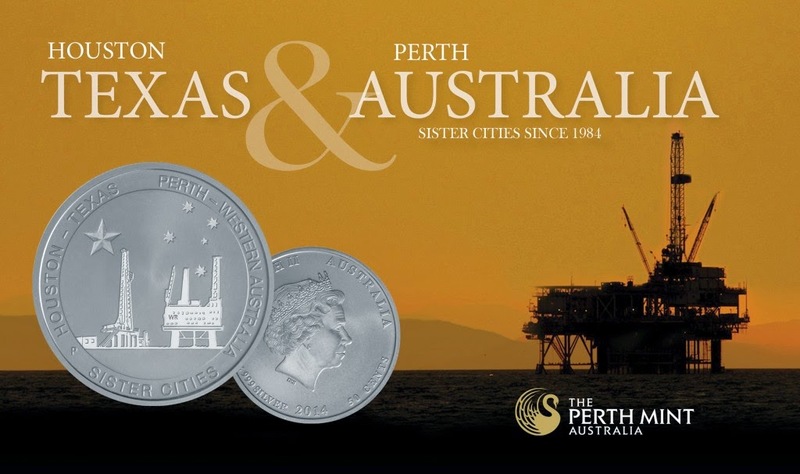 This remarkable Sister Cities coin has been exclusively minted by Perth for Texas Precious Metals. Production will be limited to 500,000 coins. The Perth Mint’s unbeatable minting experience and its use of advanced manufacturing technology contribute to the coins reputation of being the highest quality in the world. Struck by the historic Perth Mint from 99.9% pure silver, each coin’s Australian legal tender status guarantees its weight and purity. Perth Mint bullion coins are universally recognised as the most affordable means of purchasing silver bullion in the secure form of official, legal tender coins. As well as annual design changes, the coins’ restricted mintages create the potential for even greater investment return in the form of a numismatic premium.